Octoberfest runs through October 7 but these recipes will taste good all Fall and Winter long. You won’t believe how super easy and tasty the spatzle noodles are. The recipe doesn’t make very much so you’ll want to double it. The onion cake would make a great appetizer or vegetarian entree. You could easily make the potato salad vegetarian by using Fakin Bacon and substitute seitan or tempeh in the soup. Boil potatoes in salted water until tender. Let cool slightly, then peel and slice while still warm. Place in a large bowl. While potatoes are cooking prepare dressing. Cook bacon in a skillet over medium high heat until browned. Remove bacon with a slotted sppoon and set aside. (Do not drain the fat.) Add broth and onion to the skillet and cook for about 8 minutes, stirring frequently, until onions are soft. Stir in vinegar, salt, pepper, and sugar. Add this mixture to potato slices along with the cooked bacon and chives and toss. Taste and add more salt if needed. Serve potato salad warm or at room temperature. In a large heavy pot, melt butter over medium heat. Add onion and apple; cook, stirring, until onion softens, 4 to 6 minutes. Stir in red cabbage and season with salt and pepper. Add cider vinegar, sugar, caraway seeds, and water. Bring to a boil; reduce to a simmer, cover, and cook until cabbage is tender, about 30 minutes, stirring frequently. In a large bowl, combine the flour and salt. In another mixing bowl, whisk the eggs and water together. Make a well in the center of the dry ingredients and pour in the egg mixture. Gradually draw in the flour from the sides and combine well; the dough should be smooth and thick. Let the dough rest for 15 minutes. Bring 3 quarts of salted water to a boil in a large pot, then reduce to a simmer. To form the spaetzle, hold a spaetzle maker or box grater with large holes over simmering water and push the dough through the holes with a rubber spatula. Do this in batches so you don’t overcrowd the pot. Cook for 3 to 4 minutes, stirring gently to prevent sticking. Dump the spaetzle into a colander and give it a quick rinse with cool water. Optional: Melt the butter in a large skillet over medium heat and add the spaetzle; tossing to coat. Cook the spaetzle for 1 to 2 minutes to give the noodles some color. 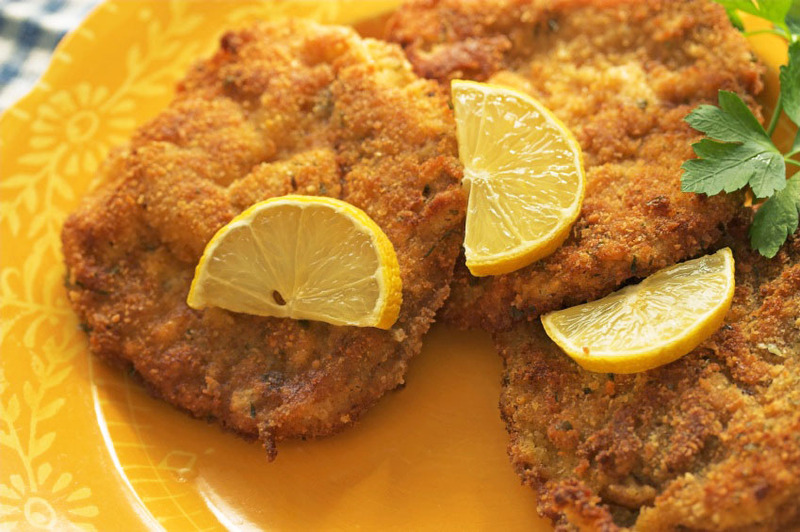 Use a mallet to pound the pork cutlets to 1/4-1/8 inch thickness between sheets of plastic wrap. Set out 3 shallow bowls. One with a mixture of the flour, salt, and pepper. The second with the egg and milk whisked together. The third with a mixture of the bread crumbs and paprika. Heat the oil in a large skillet on medium high heat. Dredge the cutlets first in the seasoned flour, then dip the cutlets in the egg mixture, and then into the bread crumbs. Working in batches, sauté the cutlets for about 2-3 minutes per side until golden brown. Remove the cutlets from the skillet, drain on a paper towel-lined plate, and cover with foil or place in a warm oven to keep warm. Serve with lemon wedges. Heat oil in a large heavy pot over medium-high heat until it shimmers, then cook beef, stirring occasionally, until browned and beginning to exude liquid, about 5 minutes. Add onions, green pepper, garlic, caraway seeds, and marjoram and cook, stirring occasionally, until onions are translucent, about 5 minutes. Add flour and cook, stirring frequently, until mixture sticks to bottom of pot and is golden, about 1-2 minutes. Add tomato paste, ketchup, paprika, Worcestershire sauce and salt and cook, stirring, 1 minute, then stir in hot broth. Scrape up any browned bits from the bottom of the pot. Bring to a boil, stirring occasionally, then simmer, partially covered, stirring occasionally, until meat is tender, at least 1 hour. Serve with a dollop of sour cream. In medium skillet, saute the onions in butter over medium heat until they turn translucent and just begin to brown, about 25 minutes, stirring frequently. Pour into a bowl and aside to cool. Beat the egg and sour cream together and stir into the cooled onion mixture along with the salt, pepper and caraway seeds. Preheat oven to 450°F. In a food processor bowl place flour, baking powder, and salt and pulse to combine. Add the butter and process just until it is the texture of soft crumbs. Add the milk and pulse to form a soft dough. Spray a 10 inch round cake pan with cooking spray and spread the dough out evenly using your fingers. Bring the dough up the sides of the pan. Spread the onion mixture over the dough. Bake for 30 minutes or until lightly browned. Roll up the filling encasing the apples and tucking in the edges as you roll. Brush top of the strudel with butter.